"There was a meeting of two days at Newmarket this time of year, to see the sweetest little horse run that ever was; his name is Gimcrack, he is delightful. Lord Rockingham, the Duke of Grafton, and General Conway kissed hands the day Gimcrack ran. I must say I was more anxious about the horse than the Ministry." At the time Lady Bunbury wrote this, Gimcrack was owned by Frederick St. John, (2nd) Lord Bolingbroke, a Jockey Club steward who owned a number of other good racehorses, including Lustre and Turf; the latter beat (King) Herod in a 1,000 Guineas match in 1767. Bolingbroke was one of Gimcrack's many owners -- including, later, Lady Bunbury's husband, Sir Charles Bunbury -- throughout his long and celebrated racing career. Lady Bunbury herself was no stranger to horses, nor to the politics to which she alludes in the letter. Her grandfather, the first Duke of Richmond, was an illegitimate son of King Charles II. He had owned and bred racehorses and served as the King's Master of the Horse. 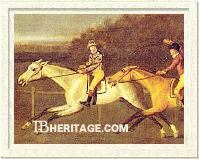 Her father, the second Duke, also served as the Royal Master of the Horse, from 1734 to 1750, and established the exclusive Charlton Hunt Club in 1737. Her brother, Charles, succeeded as Duke in 1750, and was at the time she wrote this letter, an enthusiastic participant of the hunt and the turf. Her husband, Sir Charles Bunbury, 6th Bart. (1740-1821), was an M.P. for forty years, but his attention was mostly held by horse racing and breeding. He was co-founder, with his friend, the 12th Earl of Derby, of the Epsom Derby -- but for a coin toss it would have been called the Epsom Bunbury-- and owner of the horse who first won it, Diomed. Lady Sarah, whose hand, at the tender age of fourteen, had been sought by King George III, was rushed into marriage with Bunbury. She was the focus of adoration for a number of powerful men at court, and was the subject of verses regarding her flirtations. In 1769 she left Bunbury, eventually divorcing him, and marrying George Napier, M.P., by whom she had three famous sons. Gimcrack was bred by Gideon Elliot of Murrel Green, Hampshire, who owned his dam, Miss Elliot, by George Grisewood's horse, Partner. His sire, Cripple, a son of the Godolphin Arabian, also got Tantrum, who won the Doncaster Cup in 1769 and later was a good broodmare sire. Grey, like both his parents, at maturity his height was variously given as fourteen hands, fourteen hands and one-quarter inch, and fourteen hands and five-eighths inches. He was sold to a Mr. Green, and debuted at age 4 at Epsom, where he won a £50 plate, beating the good racehorse Antelope (by Brilliant), and several others. He was unbeaten that year, running at Guildford, Winchester, Bedford, Barnet, Reading and Burford, mostly in four mile and two mile heats, and besting the top horses of his day, including Hazard (by Oroonoko), Lass of the Mill, and Lady Thigh. 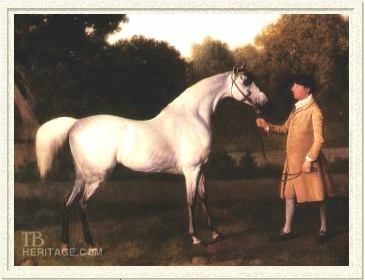 At the end of 1764 he was sold to William Wildman, the purchaser and first owner of Eclipse. For Wildman, Gimcrack won one race at Newmarket First Spring meet, beating the Regulus son Prophet, and Treasurer, by Sampson, after which he was sold to Bolingbroke, who, at the same meet, setting him up in a 500 guineas match against Selim, took a 250 guineas forfeit from Selim's owner. Gimcrack remained at Newmarket to run in the Second Spring meet, and beat two good horses, Rocket, and Ascham, in separate 1,000 Guineas matches. In October, he won a 500 guineas match against the good racehorse Drone. Two days later he lost his first race, a 500 guineas match against Bay Malton, in which he conceded 7 pounds. All these races were over 4 miles. After Newmarket October meet, Gimcrack was purchased by the Louis-Léon-Felicité de Brancas, the comte de Lauraguais (later duc de Brancas) and sent to France to run, in 1766, in a twenty-two and one-half mile race against the clock, which he "won" by coming in under an hour. The harsh and demanding nature of such an effort brought universal condemnation in the British press. Gimcrack was back on British turf in 1767, running under the count's colors. His efforts at age six were erratic: he won £50 at Wisbeach, at Ascot, at Marlborough (beating Selim again), and at Wells. But he lost the same amount several times: to Otterly at Wantage, to Tortoise at Odsey, and to Tyrant at Newmarket, running second in all those races. At age eight, in 1768, still running for the Count, he won at Epsom and at Ascot, and then took the City Bowl at Salisbury, a race Eclipse would win the following year. After Salisbury, he was sold to Sir Charles Bunbury, who sent him north to York to contest the Great Subscription Purse, where he came second to Pilgrim, conceding weight to him and the rest of the field. He ran one more race at Odsey that year, over four miles, winning the purse of £50. In 1769 Gimcrack, now age nine, won a £50 purse over the Beacon Course at Newmarket, beating Cardinal Puff and Bay Malton; a 300 guineas match against Baber, by Blank; and then lost a 300 guineas match against the five year old Cosmos. Bunbury sold the game little grey to Richard, Earl of Grosvenor after his loss, in which Bunbury lost a great deal of money in betting. At Newmarket Second Spring, Gimcrack, now running for Grosvenor, won a 300 guineas match against Jacko, by the Godolphin Hunter. In August, Grosvenor sent him to York to run in the Great Subscription race again, where he was beaten by Chatsworth and Tortoise. In 1770, now a truly aged horse of ten years, still running for Grosvenor, he won a match for the Whip and 200 guineas at Newmarket First Spring meet, against Pilgrim, and a £50 purse at Blandford in July. That year he ran fifth for the Jockey Club Plate at Newmarket, won by Bellario, his only race in which he was unplaced. In October, also at Newmarket lost again to Bellario in a sweep. Bellario was by Brilliant and owned by Gimcrack's former owner, Bunbury. Gimcrack at age 5, with John Pratt up. His coat later lightened to a snowy white. Gimcrack's last race was run in 1771, at age eleven, when he beat Bellario and Sportsman, by Regulus, in a £50 purse race at Newmarket First Spring. The tough little horse was allowed to retire to the Grosvenor stud after this victory. Some turf writers claim he was not of the highest class, yet he met and beat almost all of the top race horses of his day, usually conceding not only weight, but age. He was univerally admired during his time, and especially "beloved of York," where Ye Anciente Fraternite of York Gimcracks, commonly known as the Gimcrack Club, was founded in 1770, named in his honor. Since 1846, the owner of the winner of the Gimcrack Stakes, now a 6 furlong race for high class two year olds at York in August, is invited to speak at the club -- Mill Reef and Rock of Gibralter are two more recent winners of this race who have gone on to win English classic races at age 3. Gimcrack's longest lasting influence on the thoroughbred was through a son, MEDLEY, who was sent to the U.S., and through an unnamed daughter (chestnut, 1778) -- out of the Snap mare Snapdragon (1759) -- whose daughter, by Pot-8-Os, was also sent to America; both MEDLEY, and the Gimcrack grandaughter by Pot-8-Os had a significant impact on American thoroughbred bloodlines. The Pot-8-Os mare, bred to imported Messenger, produced the grey filly, Miller's Damsel, "Queen of the Northern Turf," a winner in New York, New Jersey, Pennsylvania and Washington who was seldom defeated. Miller's Damsel, in turn, became the dam of American Eclipse, a top race horse and later sire of good four-mile racers. Miller's Damsel also produced four daughters, all of whom became important broodmares. In his four years of racing in England, MEDLEY, won nine races and two matches, and a forfeit in a third match. Imported into the U.S. in the fall of 1784, he proved a sire of top racehorses. 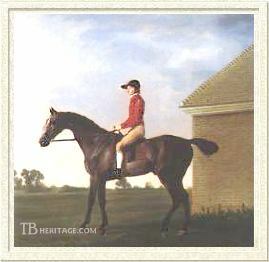 John Tayloe III, who bred some of his most distinguished descendants, described Medley as "one of the most beautiful horses I ever saw," and his sons, "...the best racers of their day, although they were generally small; but their limbs were remarkably fine, and they were distinguished for their ability to carry weight." MEDLEY, sired some influential sons whose daughters and grandaughters are woven into the fabric of American bloodlines, and MEDLEY, himself got three daughters who are the foundation mares of American families A3, A4 and A36. In England, a Gimcrack son, GREY ROBIN (grey, 1773), also out of Snapdragon, who was in the Grosvenor stud, was a successful race horse for Lord Grosvenor, winning the Great Sweepstakes in 1777 at Newmarket over the four-plus mile Beacon Course, a purse worth 5,500 guineas. Other Gimcrack foals listed in the General Stud Book were primarily from mares in the Grosvenor stud.